Share New Blues Revolution's EPK! Recently called “Southern California’s Hardest-Working Blues Band by one writer, there are some weeks where New Blues Revolution (NBR for short) plays as many as five gigs in a week. Their hard work ethic is paying off: First, with a high-profile feature story in the January 2013 issue of the popular Southland Blues magazine; followed by an equally high-profile performance at the recent 2013 NAMM Convention. Main NBR core members Bill Grisolia and Chap Cooper recently spoke with All Access Magazine Publisher Debra Stocker about their NAMM show, new album and more. AAM: Let’s start by discussing New Blues Revolution’s recent show at the 2013 NAMM Convention. What audience were you hoping to reach there that you normally might not play in front of? Chap: As you know – NAMM stands for the National Association of Musical Manufacturers. This show is always the “Place to Be” for everyone connected to this industry – Musicians, Music Stores, Manufacturers, Recording Studios, Pro AV, Celebrities, Industry Heavy Weights and more were all there. And we wanted to reach them all! Bill: People from all parts of California, the U.S. and other countries came together to watch us perform! It was thrilling to have such a broad cross-section of the planet respond to what we were doing. A large part of the NAMM community came out to see Chap, who is a long-time fixture of the NAMM show and much beloved among musicians, manufacturers’ representatives and sound reinforcement professionals. AAM: What kind of contacts and/or networking opportunities did you both take advantage of at NAMM? Chap: Word of mouth gets around quick at NAMM. Our show was our calling card and created lots of opportunities – industry contacts, endorsements, gear, fans and a great time seeing other musicians play. Bill: A phalanx of photographers and videographers lined the stage while we performed. The mass market and the online community are beginning to enjoy those images now. Other members of the music press interviewed us during the show – we are particularly excited about an interview we for Blues E-News at the Yamaha Pavilion. I am a long-time Yamaha endorsee and it was a thrill to record our interview there. We had a great turnout too among Yamaha’s professionals including Jeff Hawley, Director, Customer Experience Group, Yamaha, and Peter Giles, President of Giles Communications (Yamaha). AAM: Going to a NAMM Convention, what “tools” do you come armed (prepared) with? Chap: A special badge is actually needed to attend NAMM (which we were able to obtain). However, you did not need a badge to see our show at the Hilton. Other than the badge, lots of CD’s to hand out to our fans and new contacts. Bill: This year we were fortunate to be profiled in a Southland Blues feature story magazine that came out before NAMM. Reprints of the article were passed out and we distributed links to the article. The timing was fantastic and the write-up was very favorable! We also have a compilation demo video of our live show which we were able to hand people on thumb drives with the video file ready to play as well as direct people to online! Of course, cards and stickers as well as all collateral materials feature our logo, the microphone clenched in the famous NBR “Power To the People” fist. AAM: How has the NAMM Convention changed over the years? Chap: It gets bigger and bigger. More of everything! Bill: The Anaheim Center (where NAMM takes place) was recently remodeled. The Convention Center has continued to improve the physical space. This year they inaugurated a new outdoor stage and commons area which really helped build community, and I know will be an important fixture in years to come. Next year look for New Blues Revolution to play that stage too! AAM: What does 2013 hold in store for New Blues Revolution? 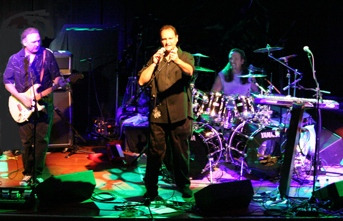 Bill: We are releasing our CD “Revolution #9” and will have CD release parties in L.A., Orange and San Diego counties. We look forward to our continuing relationships with Blues societies and both House of Blues locations (West Hollywood and Anaheim). Last year we were offered out-of-state festivals in Denver and Phoenix and we look forward to more interstate festival work this year. Friday night, you can catch a blues-rock band that’s receiving rave reviews from critics everywhere as New Blues Revolution makes a stand at Arcadia Blues Club. The band set box office records performing at House of Blues in Hollywood and pulls big crowds at other top venues around the area. They’ve also proven to be a top draw at music festivals and concerts around the country and in Europe. NBR has opened for a diverse range of artists, including Macy Gray, Leon Russell, Dionne Warwick, Rick Derringer, Blood, Sweat and Tears and Three Dog Night. That sort of diversity speaks to the band’s appeal to a wide-ranging audience. They were nominated for “Best Americana, Blues or Roots Artist” by the LA Music Awards last year. nice, the service was beyond excellent. by singer, songwriter and pianist Bill Grisolia. would fit perfectly on that stage. took us into some interesting musical territory. to the southern rock sound of Molly Hatchet. the group’s CD Revolution # 9.
demand the range that Al Green gives this song. song like that always comes off less than stellar. ring as true as they could. “SoCal’s Hardest-Working Blues Band,” progressive blues purveyors the New Blues Revolution, will perform at the 2013 National Association of Music Merchandisers (NAMM), on the Anaheim Hilton Main Stage, 777 W. Convention Way, Saturday, January 26, at 11 a.m.
New Blues Revolution (or NBR for short) are on a righteous mission to bring their tasty high-energy musical hybrid of blues, rock, jazz and soul to Southern California's finer live music establishments as well as the rest of the United States and beyond. 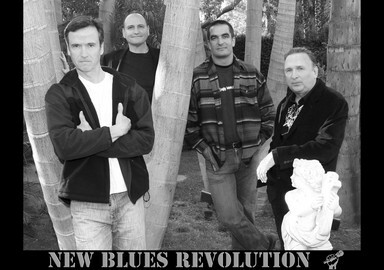 Recently nominated for “2012 Musical Group Of The Year” by the Los Angeles Music Awards, the New Blues Revolution continues a long winning streak into 2013. NBR leads the vanguard of the new Blues movement in the U.S. akin to the boom in the British Blues in the 1960’s; they work to broaden, deepen and contemporize the blues. The band once set a box office record performing at the House of Blues on the Sunset Strip and continues to draw solid crowds at other top venues (including the House of Blues/Anaheim), concerts and festivals all over the United States and Europe. They have opened for a diverse range of music legends including Tab Benoit, Macy Gray, Leon Russell, Rick Derringer, Burt Bacharach, Blood Sweat & Tears, Three Dog Night, David Lindley, Michael Burks and singer-actress, Katey Sagal. Forging a unique, distinctive style featuring Bill Grisolia's vocals and piano and Chap Cooper’s guitar, NBR brings exciting showmanship to a mix of high-energy New Blues numbers and ballads – deep, modern, rocky but soulful. New Blues Revolution has received great reviews from national trade magazines such as Cashbox and Music Connection, with critics recognizing NBR’s exciting talent and solid songwriting. Front man Bill Grisolia (Singer-Songwriter-Pianist) is active in his community and always brings along the music. Bill was elected to two national nominating conventions, appointed twice as a Commissioner in Long Beach (where he became an advocate for the homeless) and has been a restaurateur, as the onetime owner of Sunfish Grill in Long Beach’s Shoreline Village. While Bill’s first memories of life are the Spanish coast of the Mediterranean, the bilingual singer grew up in the blues/rock/jazz stew of Kansas City. Grisolia’s international career began at age eighteen when he started playing top clubs Tres Triste Tigres and Pub Gent in the rough Barrio Del Carmen district of Valencia, Spain. Self-taught, Bill earned himself an endorsement contract with Yamaha acoustic pianos. Before he was 12, NBR guitarist Chap Cooper played rhythm guitar with members of the Yardbirds and the Paul Butterfield Blues Band among others. By then it was actually old hat for Cooper, who scored his first paying gig at the age of eight. Growing up among Rock's most famous legends has resulted in Chap having worked with many top musicians and recording artists. Early on, Chap led the house band at top Sunset Strip locale, Gazzari’s. Imagine a gifted young singer/pianist growing up on the Coast of Spain honing his Blues chops throughout the clubs of Valencia. Half-way around the world, imagine a young guitarist growing up in Los Angeles, playing rhythm guitar for members of the Yardbirds and Paul Butterfield Blues band at the age of 12. Both would continue to explore their "Blues Journey" and go on to play many of the most famous venues in the world. Not too long ago, their paths and collective pasts would collide together in the creation and concept of the "New Blues Revolution". Now imagine an inspiring yet compelling journey with something unknown yet something you have always known. Meet the New Blues Revolution. The band leads the vanguard of the new blues movement in the U.S. Akin to the boom in the British Blues in the 1960s, they work to broaden, deepen and contemporize the blues. Recent performance highlights include playing the House of Blues on the Sunset Strip and at Downtown Disney, concerts and festivals including invitations to festivals in Arvada, Colorado and Phoenix, Arizona. They open for a diverse range of music legends including Tab Benoit, Macy Gray, Leon Russell, Rick Derringer, David Lindley, and the late, Michael Burks. Forging a unique, distinctive style featuring Bill Grisolia's vocals and piano and Chap Coopers guitar, the band brings exciting showmanship to a mix of high-energy New Blues songs  deep, modern, rocky but soulful. A favorite of critics, The New Blues Revolution receives rave reviews from national trade magazines such as Cashbox and Music Connection. Critics recognize NBRs exciting talent and their extraordinary songwriting. Their song Blue Revolution was nominated for an LA Music Award. The bands exciting live show makes for great TV. Television appearances include live satellite broadcasts from New York City to prime-time television in Spain. Broadcast performances in major U.S. television markets (UPN in Los Angeles) confirm the appeal of the band's music across the U.S. Los Angeles television appearances include KNBC, KCAL, KCOP and KMEX including the number one morning show in the LA market. NBR was featured on the "Artist Spotlight" of American Veterans Radio network. Before he was 12, Chap played rhythm guitar for members of the Yardbirds and the Paul Butterfield Blues Band. 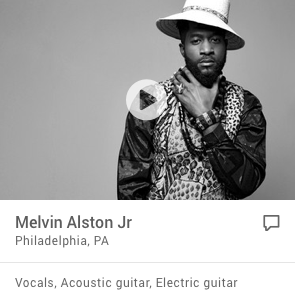 It was old hat to the guitarist who scored his first paying gig at age 8. Growing up among Rock's most famous legends has lead to his working with many top musicians and recording artists. Early on, Chap led the house band at Gazzaris, a top Sunset Strip locale. Bills first memories of life are of the Spanish coast of the Mediterranean. The bilingual singer grew up in the blues rock jazz stew of Kansas City. His international career began at 18 by playing the top clubs of Valencia, Spain (Tres Triste Tigres and Pub Gent). Self taught, he earned himself an endorsement with Yamaha acoustic pianos.